Feb 2016 – Where Should Shaping Clay Grow? At our February 26th meeting we discussed what role should Shaping Clay play in 2016? How can we as a group make a difference in Clay County? It was a far ranging discussion, with these notes capturing the high points. From the outset there was consensus that we don’t want to rehash discussions being held at other groups. We all attend different meetings but somehow they all focus on the same themes, so it becomes repetitive. As an organization we are not looking to reinvent the wheel, rather provide support and make connections for ongoing efforts and seek ways to expand the impact of Clay County’s nonprofits. The group around the table felt that it made sense that the Mercy Network focus on the first 2 levels, the social service needs of the community. 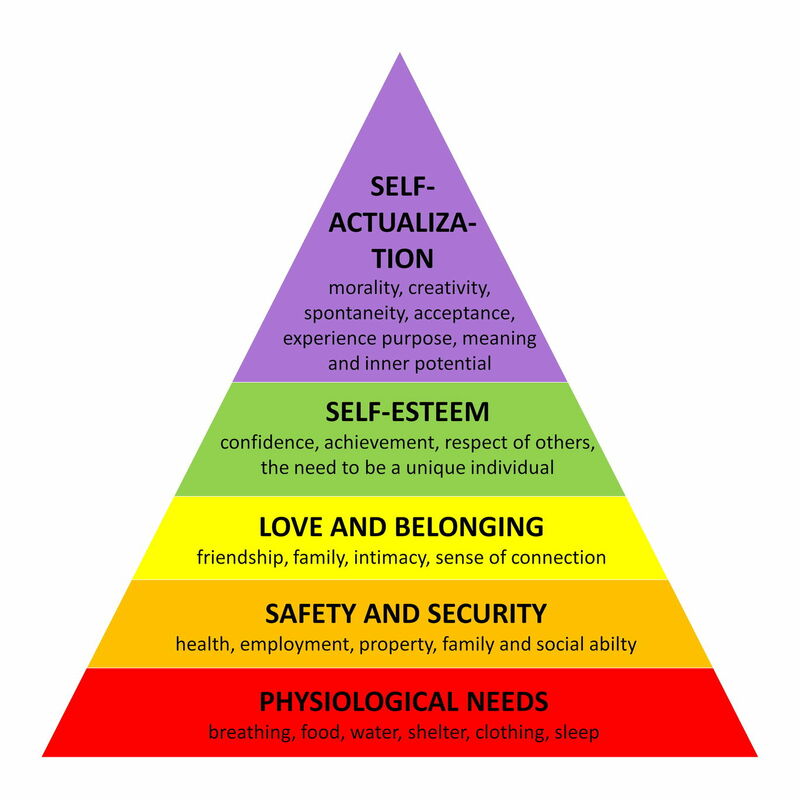 Shaping Clay could then focus on the top 3 levels, those areas that nurture and enrich the well-being of the whole community, not just those faced with a need for support. The image of two circles, one inside the other better captured what the group was trying to express. 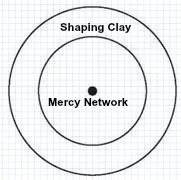 The Mercy Network was the core, the center circle. Shaping Clay would encircle it and would focus on enrichment for the entire community, including those within the core. During 2016 Shaping Clay is poised to venture into some new territory. We want to explore how the nonprofits can collaborate with a variety of other stakeholders in Clay County. Some of these other groups / topics previously identified during our 2015 meetings include: Libraries, Agriculture, Emergency Planning, Education, Legislators, Government, Speaker’s Bureau, Storytelling, Volunteer Directory, and Resource Directory. Sponsor a panel discussion on a topic that would bring together and be of interest to both the Mercy Network and Shaping Clay participants. Two such topics come to mind – Agriculture or Emergency Management Services. In light of the foregoing discussion Doug and Karen got the ball rolling by identifying the topics for our next 3 meetings. Details to follow and suggestions are welcome for these topics and the balance of the year. March 25 Libraries. This meeting will be held at the Orange Park Library from 8:30 – 10:30. April 29 Agriculture. This meeting will be held at St. Vincent’s Middleburg from 8:30 – 10:30. At our January 29 meeting the focus was on health initiatives and resources in Clay County. We reviewed the CHIP (Clay Health Improvement Plan) implementation plan introduced earlier in January. 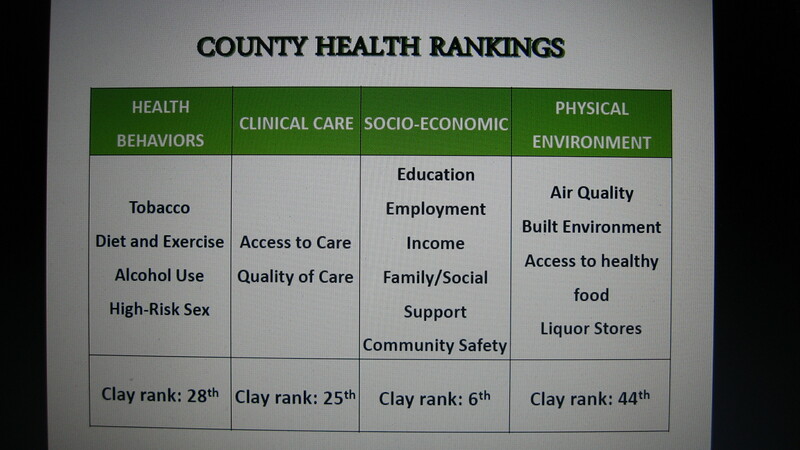 According to the 2016 County Health Rankings Report for Florida released by the Robert Wood Johnson Foundation, out of 67 counties in Florida, here’s where Clay County ranks. Anyone who would like to contribute to these efforts is welcome to participate. In order to find out more about each group – who’s participating, what has already been discussed, and when each group will meet next, contact Emily Suter of the Health Planning Council of Northeast Florida at emily_suter@hpcnef.org or Jose Morales of the Florida Department of Health / Clay County at jose.morales@flhealth.gov. Copies of the newly released Clay County Quality of Life Report were handed out at our meeting. Check it out at: http://www.claytodayonline.com/stories/clay-county-quality-of-life-progress-report,357. You can obtain a hard copy of the report at the Clay Chamber office. This 2015 Second Edition updates the initial report published in 2008 and is a guide for building a better community. Everyone is encouraged to read it as it provides a high-level review of where we stand in the 10 areas of: Arts & Culture, Economy, Education, Health, Public Safety, Recreation, Environment, Governance, Social Well-Being, and Transportation. Samantha of ILRC (Independent Living Resource Center) led our discussion by noting that her agency is challenged because while it serves people with disabilities, they represent a broad spectrum of income brackets and age ranges. Consequently there is not a one-size fits all response, rather they must be able to match the appropriate resources for each individual. Teresa head of the Penney Retirement Community (PRC) shared that she has brought a physician into the community and is looking for ways to connect this resource to the broader community. While the residents at PRC are retired and need health care, many come from professional fields, are very active, and volunteer in many ways in the community. Joseph, a student at Saint Leo and active member of the Navy based at Mayport told us of an innovative program that is looking to provide ‘tiny houses’ for our veterans. Sandy a Board of Trustee member of the Clay County Library reminds us that we should remember when delivering services and seeking ways to make connections in the community, the library is a caring and supportive environment. It is a place where people feel safe to come and gives those without access to the Internet a place to do so. Mitzi from Community Hospice which provides palliative care for patients and their families noted that health care access is impacted in her organization due to a shortage of nurses. Also they are challenged in letting people know about the availability and benefit of using their services. Leteja from the Northeast Florida Community Action Agency works to develop self-sufficiency in its customers by providing guidance in education, work, and financial resources. Their intake interview process is only about 15 minutes and they are challenged when working with someone that has a mental health issue. There is a stigma that comes with mental health issues. Christy from the Quigley House let us know that they too find that some are still not aware of the services they provide for domestic abuse and sexual assault victims. They conduct in the workplace presentations to get the word out. In terms of providing services they are presently challenged because of having only one counselor on staff. Anna from the Council on Aging, which serves people age 60 and above or disabled has 4 senior centers and through Clay Transit provides transportation throughout the county for everyone. They provide in-home health services, adult day care, companion and respite care, meals-on-wheels, and energy assistance and are a referring agency for groups sitting around the table. See notes at the end about the Clay County Senior Services Coalition which formed from our July 2015 Shaping Clay meeting on seniors. Emily and Vultheara from the Health Planning Council of Northeast Florida gave us an update on the CHIP meeting that has already taken place and what’s upcoming. There are three initiatives that were identified by the Unhealthy Lifestyle / Prevention Group. Focusing on healthy weight for children and adults. Looking at health in the built environment, such as walkability. Implementing health policies in schools such as distributing candy as a reward should be replaced and taking away recess and phys ed are not helpful in reinforcing a healthy lifestyle. Heather, head of the Florida Department of Health / Clay County observed that being new to Clay County there is no one source for information about available resources. She suggests that such a resource directory include what is being provided, who’s providing it, and the eligibility requirements. It was noted that accessibility doesn’t mean that it’s not available; it may mean that eligibility requirements are not being met. Jose also from the Department noted that access to mental health services, especially pediatric are limited, resulting in long waiting times. Anna from the Way Free Medical Clinic reiterated that while they serve many in the community, there are people who need their services, but can’t get there due to lack of transportation. Rachelle from Baptist Health would like to see us support mental health the way we do cancer. At one time cancer was stigmatized, but has come to the forefront and receives lots of support. Why not the same for mental health? Allie from Big Brothers / Big Sisters noted that many of the children they connect with mentors are from single parent families. The problems that we see with children are reflective of what’s going on with the parents at home. Doug from the Clay County Literacy Coalition reminded us of the importance of literacy in maintaining health. For example if you can’t read your prescription this can cause problems. Literacy is an important first step in being healthy. Karen from Utility Bill Checkup shared about Creation Health, an exciting holistic health program that is being held Tuesday nights at the Barco-Newton Family YMCA in Fleming Island from 6:30 – 8:00 p.m. It costs $25 to register and classes are free. The eight sessions include choice, rest, environment, activity, trust, interpersonal relationships, outlook, and nutrition and one can join at any time. Andre Van Heerden is the coordinator and we are looking for more facilitators and additional locations to hold this program in Clay County. Open discussion resulted in the following suggestions / comments. The need for a resource directory is high priority, but one of the challenges is keeping it updated. Adding eligibility requirements would make it much more useful. How can we use grocery stores, CVS, Walgreens and other pharmacies to help spread the word about healthy choices and behaviors? We need to be more politically active, to generate awareness and support from our elected officials. We need to find ways to make a difference and the earlier the better. Here is an update to what’s going on at the Clay County Senior Services Coalition. Anyone interested in working on these or other senior issues is encouraged to contact Shereen Snare at the Council on Aging shereens@claycoa.org who is coordinating this group.